The newly-formed agency secured the account after a competitive pitch against international players. "Travelling, like food and beverage, is something that is very close to heart of Hong Kongers," said Angel Yip, head of Madbox Consultant. "And the appetite for Hong Kongers to travel is only growing by year. The hotel and accommodation booking website selected the new agency, which Yip only founded in 2014 as its public relations partner of record in Hong Kong. "Madbox had impressed us with their forward-thinking, creative communications plan that fits our business in Hong Kong," said Zoe Chan, PR Director, Asia Pacific of Hotels.com. The company has further plans to expand its presence in the city. Yip is the former deputy general manager for Waggener Edstrom in Hong Kong and her new firm primarily focuses on consumer, education and technology sectors. Among its clients are Hong Kong Maxim’s Group and Genki Sushi. 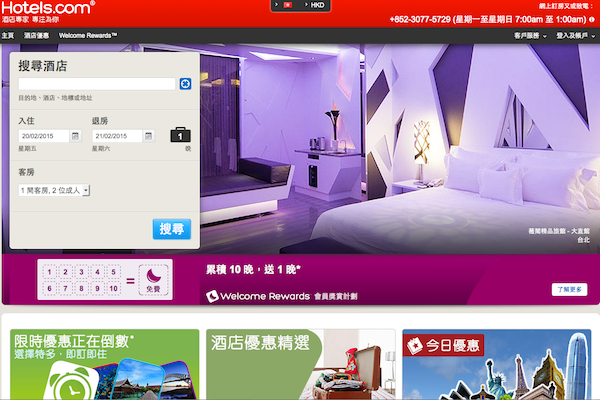 Hotels.com represents one of Madbox Consultant’s first accounts with a global footprint. Hotels.com is an online accommodation booking website with about 435,000 properties listed from around the world, from international chains to all-inclusive resorts and small local bed & breakfasts. There are more than 11 million reviews on the site, which the company claims were all written by guests who stayed at the properties. "We couldn’t be more proud to have secured a global brand such as Hotels.com for our portfolio, and we are eager to work with them and expand the brand’s audience through our storytelling and communications expertise," said Yip.